Also you are carrying genetic mutations that predispose you to have serious diseases. Would you like to know which ones? Nowadays, you have the possibility to know the degree of genetic predisposition that you have to develop diseases such as Alzheimer’s, cancer, heart attack, multiple sclerosis, etc. They are responsible for most natural deaths in developed countries. Look at the following chart. It could belong to any of us. 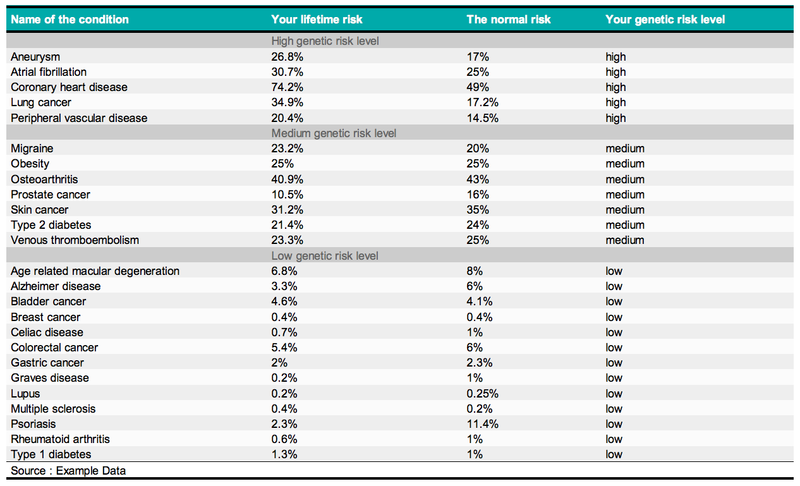 Your report would be like this one but varying the specific risk for each disease. It’s highly likely that the cause of your death is written in the first five lines. What a shock, isn’t it? Isn’t it unbelievable? Clearly, we are all going to die. This report tells us the cause of our death. The risk of contracting almost all the diseases is given by the genetic predisposition as well as by the environment and it is very interesting how this proportion varies according to each disease. For example, it is estimated that Alzheimer’s has a 75% genetic basis and a 25% environment / lifestyle basis. In the coronary artery disease, we speak about a 50% of each. These analyses are done on a DNA sample. The most common way to obtain it is by rubbing with a cotton swab the inside of the cheek inside the mouth. They are usually carried out in a clinical laboratory but nowadays they can also be done online. From an online lab, they send you home a kit for the sample collection that you need to return to them and, in about 2 weeks, they send you the result by e-mail. The price is about 300 Euros. There are people who say they would not do it because they would live in great anxiety and apprehension. Others say that they would do this test if this information would give them the opportunity to undergo preventive medicine programs or early diagnosis tests of diseases presenting a high genetic risk. Let’s imagine that you have done it. You are going to come across that neither the Public Health System nor a private insurance will cover for most of the tests that you have to perform regularly. Thus, the economic aspect is something you should consider. Recently, Angelina Jolie’s case has been discussed. Approximately 10% of women who develop breast cancer are carriers of genetic mutations. These genes predisposing to cancer are called BRCA1 and BRCA2, and are inherited from the parents. 50% of the children carry them, which means that there is a family history of breast or ovarian cancer before the age of 50. They usually have a grandmother, a mother, sisters or aunts affected. The man, if he is a carrier, transmits those to 50% of his offspring; that is why they can skip a generation. If a woman carries the BRCA1 gene, it is considered that the probabilities of developing breast and ovarian cancer are 80% and 60%, respectively. A woman carrying the BRCA2 gene, has 85% probabilities of developing breast cancer and 23% probabilities of developing ovarian cancer. Angelina Jolie is a carrier and she decided to have a bilateral mastectomy and have her ovaries removed. This is a rather special situation because you can make a very effective prevention, but this is not possible in most diseases: you cannot remove the liver, the lung, the bladder… In most of the cases, the only thing you can do is to have tests done in order to have an earlier diagnosis. Are you willing to take a “look at your future”? Would you perform it on your child? Do you think that, in the future, life insurance companies might ask for it? Previous Post Hereditary diseases. Would you like to know which ones you can transmit? Next Post Fresh or frozen embryos? Which is best?